Are you watching the Olympics this week? We're watching here at home and I love the events in the Summer Olympics. I especially enjoy watching gymnastics, but also love swimming, dressage, and soccer! If fashion was an Olympic sport, I would compete to earn the gold for the USA! 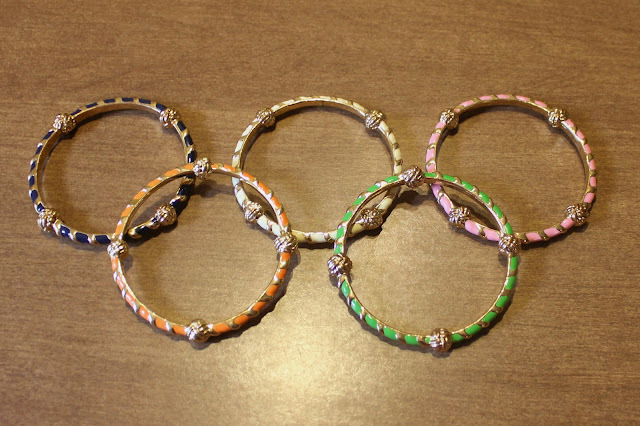 Here's my interpretation of the Olympic symbol with my Lilly bangles. Love! LOVE your bangles! I enjoy the Olympics so much...gymnastics, swimming, & diving are my faves. I absolutely love watching the Olympics and cannot get enough! The dedication of the athletes is so inspirational and makes me proud to be an American. Love your version of the Olympic rings! My favorite sports to watch are swimming, gymnastics and diving. I also love watching gymnastics! Swimming and diving are fun too!